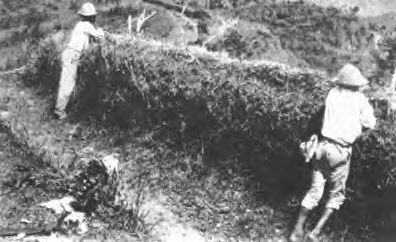 Spanish trenches in the Spanish American War battle of Asomante. Skirmish between American and Spanish forces that occurred on August 12, 1898, at Aibonito Pass, Puerto Rico. Alternately known as the Battle of Asomante Hills and Aibonito, it was the last engagement of the Puerto Rico Campaign. On August 9, 1898, Spanish forces retreated to the stronghold of Aibonito after their battle with American forces at Coamo earlier that day. Aibonito is located within the Cayey mountain range to the east of Coamo in east-central Puerto Rico. The terrain between Aibonito and Coamo fea- tures many ravines and impassable ridges that made regular military operations through them nearly impossible. Travel be- tween the two cities was conducted on the paved military road, which twisted through crooked valleys, doubled around sharp promontories, skirted steep overhanging cliffs, and hugged the sides of the precipitous slopes. To prevent Spanish forces from destroying the much-needed bridges along the road, Major General James H. Wilson deployed Troop C (Brooklyn) of the New York Volunteer Cavalry com- manded by Captain Bertram T. Clayton to pursue the fleeing Spaniards. Just over five miles beyond Coamo, Clayton’s troops came under fire from Spanish batteries placed on two hills north of Aibonito: Asomante and El Penon. Along with the batteries, the Spanish infantry had entrenched four companies of the Cazadores Patria Battalion, 70 mounted guerrillas from the 6th Provision Battalion, two provisional companies from the civilian guards, police units, and the 9th Volunteers. In all, there were some 1,280 Spanish troops on the slopes below their artillery batteries. This gave the Spanish complete coverage of the highway for several miles in either direction. The crossfire produced by the batteries and troops forced Clayton, under heavy Spanish fire, to halt his pursuit. After reconnoitering the Spanish forces at Aibonito on August 11 and 12, Wilson became convinced that a frontal assault was entirely impossible. The Spanish positions on Asomante and El Penon commanded the steep road, allowing the Spanish to fire down on the Americans and preventing American batteries from deploying. Wilson’s men then found two practical routes around both the Spanish positions, which would place American troops across the Spanish line of retreat. Both routes were obscured from Spanish troops and were exceedingly steep paths, but the trail to the left was the shorter distance. Wilson decided to utilize this route for his turning movement, and on the morning of August 12, he instructed Brigadier General Oswald H. Ernst to take the mountain trail that branched westward and northward over the divide to Barranquitas. Once at Barranquitas, Ernst would travel down the highway from the village of Honduras, placing the American forces to the rear of Aibonito. Knowing that at any minute he might receive word of an armistice, Wilson delayed Ernst’s flanking movement and sent Colonel Tasker H. Bliss under a flag of truce through the Spanish lines demanding their surrender. The message was also forwarded to the governor-general in San Juan. While the Americans waited for a response, Spanish forces at Aibonito were being reinforced from Caguas, bringing the total number of Spanish defenders to some 1,300 men. The Spanish then refused the American demands. Wilson now instructed Ernst to begin his flanking movement. To divert Spanish attention from Ernst’s movement, Wilson directed Captain R. D. Potts’s Battery F of the 3rd U. S. Artillery with its six 90-millimeter (mm) field pieces to take up a position on a low ridge some 2,150 yards from the batteries on Asomante and 400 yards below them. Opening fire at 1:25 p. m., the Spanish artillery pieces were silenced by 2:15. The American guns now turned their attention to the Spanish infantry entrenched on the slopes, driving many from their trenches. Subsequently, it appeared that the Spanish had received reinforcements, with the Americans finding themselves under a hail of shells and bullets. With Battery F’s position untenable, the guns were withdrawn. The battery suffered one killed (a lieutenant commanding one of the guns) and six wounded. Shortly before Ernst began his flanking movement, Major General Nelson A. Miles sent word to Wilson that hostilities had been halted with Spain. The Spanish-American War and the engagement at Aibonito were now concluded. Further Reading Brands, H. W. The Reckless Decade: America in the 1890s. Chicago: University of Chicago Press, 2002. Chadwick, French Ensor. The Relations of the United States and Spain V1: The Spanish-American War. Reprint ed. Kila, MT: Kessinger, 2007. Hendrickson, Kenneth E., Jr. The Spanish-American War. Westport, CT: Greenwood, 2003. O’Toole, G. J. A. The Spanish War: An American Epic, 1898. New York: Norton, 1984. Trask, David F. The War with Spain in 1898. Lincoln: University of Nebraska Press, 1996. U. S. Army general. James Harrison Wilson was born near Shawnee- town, Illinois, on September 2, 1837. He briefly attended McKendree College before enrolling at the United States Military Academy, from which he graduated seventh in his class in 1860 and was commissioned a 2nd lieutenant of topographical engineers. He spent nearly a year at Fort Vancouver, Washington Territory, before the outbreak of the American Civil War in April 1861 necessitated his transfer east. He participated in the capture of Port Royal, South Carolina, in November 1861 and also distinguished himself during the siege of Fort Pulaski, Georgia, the following April. Wilson served as an aide-de-camp to Major General George B. McClellan and accompanied him throughout the Peninsula Campaign and at the Battle of Antietam on September 17, 1862. Advanced to lieutenant colonel of volunteers, he joined Major General Ulysses S. Grant’s staff as his chief engineer in November 1862. Grant subsequently appointed Wilson inspector general of the Army of the Tennessee. Wilson played a conspicuous role at the capture of Vicksburg in July 1863 and was promoted to brigadier general of volunteers that October. In November 1863, he distinguished himself in both the Chattanooga Campaign and the relief expedition to Knoxville. Grant then recommended him for the post of chief of the Cavalry Bureau in the War Department, and Wilson assumed that position by January 1864. Wilson proceeded to overhaul and reequip the army’s mounted arm. He believed that the cavalry’s days as a shock weapon had passed and that it would be far more effective as mounted infantry. He thus issued rapid-fire Spencer carbines to his troopers and drilled them in tactics emphasizing mobility and firepower. In April 1864, Grant summoned him back as commander of the 3rd Division in Major General Philip H. Sheridan’s cavalry corps. Wilson fought well at the battles of the Wilderness and Yellow Tavern that May. In June 1864, Grant entrusted Wilson with the assignment of raiding the outskirts of Petersburg, Virginia, which was then under siege and stoutly defended by Confederate forces. Although Wilson performed effectively in campaigning around Richmond, the Wilson-Kautz Raid that June was a near disaster. Wilson subsequently fought under Sheridan in the Shenandoah Valley but on September 30 was transferred to command cavalry under Major General William T. Sherman as a major general of volunteers. Wilson accompanied Sherman throughout the Atlanta Campaign until Confederate general John Bell Hood abandoned the city and lunged for the Union supply lines in Tennessee. Wilson then joined Major General John Schofield at the defense of Franklin on November 29, 1864. Hood was repulsed, and both Union generals fell back to join Major General George H. Thomas at Nashville. On December 16, Hood’s army was smashed at Nashville, and Wilson destroyed the Confederate remnants in a vigorous pursuit. Promoted to brevet brigadier general of regulars in March 1865, Wilson was next entrusted with a cavalry corps of three divisions (13,500 men) and ordered to raid the heart of the Confederacy. This was the largest cavalry raid of the war and among the most successful. Wilson’s troopers tangled with renowned cavalry leader Lieutenant General Nathan Bedford Forrest at Ebenezer Church on April 1, 1865, defeating him. The next day, Wilson’s troopers again defeated Forrest during the capture of Selma, Alabama. It was the first time that a Union general had outmaneuvered Forrest. Montgomery, Alabama, fell on April 12, as did Columbus, Georgia, on April 20. In all, Wilson’s cavalry took more than 7,000 prisoners and 300 cannon before the end of the raid on May 20. Ten days earlier, Wilson had gained distinction when his men captured the fleeing Confederate president Jefferson Davis near Irwinville, Georgia. On June 21, Wilson received his final promotion, to major general of volunteers; he was then only 27 years old. Following the war, Wilson remained with the army, becoming a lieutenant colonel of the 35th U. S. Infantry in July 1866. He performed engineering duty along the Mississippi River before resigning in December 1870 to pursue railroad construction. He settled in Wilmington, Delaware, in 1883. 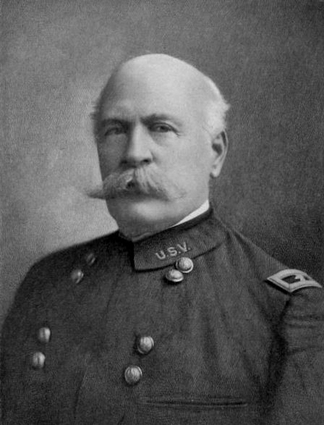 When the Spanish-American War commenced in 1898, Wilson immediately volunteered his services and was commissioned as a major general of volunteers and assigned to command VI Corps. That corps was never organized, leaving him frustrated and with- out a post. In July, he secured command of the 1st Division in I Corps, commanded by Major General Nelson A. Miles. Wilson’s 3,571-man division sailed from Charleston, South Carolina, on July 20 and arrived at Ponce, Puerto Rico, eight days later. Because of a lack of suitable small craft, the debarkation took 10 days. Wilson’s command saw little action in the fight for the island before the armistice. A portion under Brigadier General Oswald H. Ernst did fight and win the Battle of Coamo on August 9, and Wilson’s command also engaged in a skirmish at Asomante Hills on August 12. Wilson, who favored the U. S. annexation of both Cuba and Puerto Rico, was then briefly military governor of the Ponce district of Puerto Rico. He returned to the United States to head I Corps at Lexington, Kentucky, and then served in Cuba as military governor of the provinces of Matanzas and Santa Clara. During 1900- 1901, he was second-in-command of the Beijing (Peking) relief expedition under Major General Adna R. Chaffee Sr. Wilson led a joint Anglo-American punitive expedition against Patachow, the city of eight temples, but refused to burn the Buddhist pagodas in retribution for the Boxer attacks. Through a special act of Congress in February 1901, Wilson retired with the rank of brigadier general in the regular army. He represented President Theodore Roosevelt at the coronation of King Edward VII in England in 1902. In 1912, he published his memoirs, titled Under the Old Flag: Recollections of Military Operations in the War for the Union, the Spanish War, and Boxer Rebellion, Etc. In March 1915, he was advanced to major general on the retired list. Wilson died in Wilmington, Delaware, on February 23, 1925. Further Reading Evans, David. Sherman’s Horsemen: Union Cavalry Operations in the Atlanta Campaign. Bloomington: Indiana University Press, 1996. Jones, James P. Yankee Blitzkrieg: Wilson’s Raid through Alabama and Georgia. Athens: University of Georgia Press, 1976. Keenan, Jerry. Wilson’s Cavalry Corps: Union Campaigns in the Western Theater, October 1864 through Spring 1865. Jefferson, NC: McFarland, 1998. Longacre, Edward G. Grant’s Cavalryman: The Life and Wars of General James H. Wilson. Mechanicsburg, PA: Stackpole, 1996. Wilson, James Harrison. Under the Old Flag: Recollections of Military Operations in the War for the Union, the Spanish War, the Boxer Rebellion, Etc. 2 vols. New York: D. Appleton, 1912. This entry was posted in Battle, Biography by MSW. Bookmark the permalink.